This post is a short one – and a very basic post – but a needed one. Think of this like a PSA that is attempting to pay it forward to new marketers everywhere. In doing some keyword research today, I was a little startled to see tens of thousands of searches being performed centering around submitting your website to search engines. Thousands of those revolved around looking for website submission SERVICES. It’s 2013. A lot of us have been doing “this” – SEO, affiliate marketing, Internet marketing, etc. for a long, long time. And we often forget the outdated crap – and scams – that newbies to our world encounter as they’re trying to find their way and learn the ropes to promoting a website online. 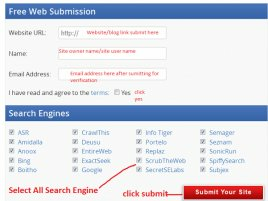 Search engine submission is outdated crap that turned into a scam. Outdated because somewhere in the late 90’s and very early 2000’s submitting your site to search engines WAS a legit way to get indexed. A scam because the companies still attempting to sell you those services know that they are now complete rip offs. Because in this day and age, there are only two engines that matter: Google and Bing (and some may argue Yahoo, but it’s powered by Bing). Both will find and index (put into their results) almost anything on their own. A lot of these services also offer to submit you to hundreds or thousands of directories. Not only will almost all of these directories never send a single qualified visitor, but getting links from them can hurt your ability to rank in the real search engines. Are you also planning to purchase those add-on free for all (FFA) links? You might as well light any chance you have of ever ranking in Google on fire and walk away now. Still nervous Google or Bing might not find your website? You don’t need to, but you can directly submit a website to Google here (which essentially amounts to making a Webmaster Tools account). And you can directly submit a website to Bing here. Yahoo is powered by Bing, so submitting to Bing is the same as submitting a website to Yahoo. AOL is powered by Google. Ask.com is irrelevant (sorry Ask). No other search engine these crappy search engine submission services claim to submit you to matters – at all. Seriously.